This plugin is intended to ease the creation of VR games/experiences in UE4. It is up to quite a few different additions now and has a fleshed out wiki to help ease into it (may be a version or two behind at times, I attempt to update it when I can, the template is generally the best informational tool). It is also intended to be compatible with multiplayer experiences without any direct changes from the end user, most of the relevant components / actors replicated themselves over the network with some customization included. It is fully Blueprint implemented but can be manually linked to and used in c++ if needed. I would like to note by the way that everything currently in the template is an example of what I think is best practices (though maybe not implemented as well as I would for an actual game), not everyone is going to need the same set up and not everyone is going to need a full VRcharacter. Custom pawns that just use the motion controllers and camera / parent relative component would be useful to people that don't want gravity / collision. It also has to give examples of far more things than an average game is likely to use, so there WILL be refactoring involved if it is used as a base for one (input bindings for one). Re-wrote how the character / player controller is initialized to be far cleaner. Added Knuckles EV2 default controller profile and changed some of the character logic to check for it in OpenVR. Removed a corrupt BP and prepped everything so that packaging with PackageAllDirectorys works without issues on the template. Reference BP Grip script will be coming later. Changed Sedan actor to use a Boxmesh around it for the navigation modifier. Added a filter to "CanBeClimbed" to always ignore grip interfaced objects. waits before sending the players HMD info to the server (so server delays itself). Overhauled how the teleport controllers get the player state and set themselves up a bit. Added socketing capability to the sample gun for the body component on the example pawn. Added a socketing check to the VivePawnCharacter in the CallCorrectDropEvent area of the event graph (really simple). More complex implementations could skip querying the object and check themselves, or do other things. Corrected Epics roomscale rotation for teleport boundries (unsure if they fixed this in their base template ever). 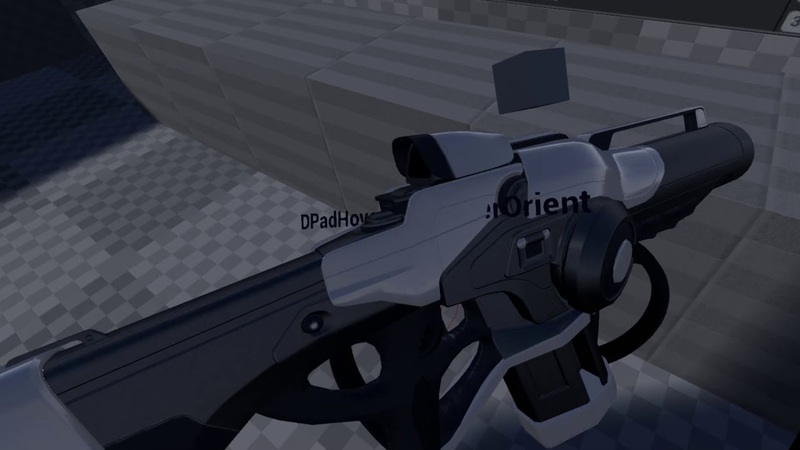 Changed the IsHeld Implementation and added AllowsMultiGrip to the VRGripInterface to prepare for some future features. Pushed a new update live to both repositories yesterday, forgot to update this thread. I made a bucket updating system for 4.22 to manage the client auth throwing addition and when I saw the new subsystem engine capability I decided it made more sense as one of those. Figured that as long as I was cleaning it up and generalizing it more that I would add some blueprint accessibility to it as well for others to use if they choose too. status for a time-out period or is picked up it will end the replication. This is a very alpha feature and will need improvements likely over time. and walks up the ownership chain for authority. Improved oldmove sends missing some special movement flags with CMC's. Added initial replication state to the button component. Fixed initial replication somewhat with the VRSlider. Made all interactibles and grippable components turn off movement replication when gripped. This makes it significantly safer to keep them replicating movement. initial transform (specifically not re-calculating the angle correctly). replication for the component is better if this is needed to be disabled. function bodies out of headers and moving them into the .cpp. Added EndPlay to grip scripts to allow people to manage timers and cleanup better. Removed Grip Script BeginPlay being blueprint callable, that was never intended. when the secondary attachment changed but its still a secondary. Changed to sending the full transform on drop with client auth grips instead of just position / rotation. with an option to revert back to direct hand sampling. data and fire the events for it. Whether you do anything else with it or not is up to you. dropping simulation logic, it is also auto excluded from late updates. Stopped calling "StopSimulating" on Custom Gripped objects automatically. will need to call it in the OnGrip event themselves. and smoothing is off by default in the plugin so this took awhile to run into. as well as from the server to the gripped object for setting. Also added the option to UseGlobalVirtualStockSettings in the gun tools grip script. When enabled it will load the current settings from the global settings (default true and only for locally controlled). When disabled it uses local settings of the script. the same frame instead of the next. was being done wouldn't work with the new placement of the query. mostly fixing Axis_Y issues since it is the last order of operations with Quats. Moved button overlap bindings later in init to avoid an editor copy error. with avoiding extra casts to check for local owner OnGrip ect. Changed LerpToHand to be a fixed time period of lerp, not speed based. script won't activate on grip. Default of 0.0f means that it will always activate. Also added a curve editor to it that is optional. SHOULD NOT BE USED warning from gun tools. Fixed a scaling bug with the auto SnapToSocket setup when gripping. Finalized beta version of GunTools Grip Script, supports pivot offsets, recoil instances, virtual mount settings, extended smoothing. Moved smoothing settings out of default grips and into the gun tools grip script. Added "WantsDenyLateUpdates" to grip scripts allowing grip scripts to deny late updates when they don't want them. Opened up Grip Scripts to be editable per instance again instead of just in defaults. Added remote grip pivot setting to the motion controllers, allows easier remote gripping and custom operations / mobile VR ease of use. to save some perf on grips that will be denied anyway. Also use teleport for movement from seated position. Fixes some collision issues exiting a physics vehicle. Made bDenyGripping defaults visible for all interactibles. Added new DeltaTeleportation, a new teleport type added to help alieviate teleporting with physics simulating skeletal bodies in hand. Am now filling in the Component Velocity member of the GripMotionControllers. Added OnStartedTracking and OnEndedTracking events to the motion controllers. Added prelim OnBeginInteraction and OnEndInteraction events to the button component. Also added the Interacting Component to the button events as it is useful in itself. were not correctly clearing overlap passes. Fixed multiple missing includes that UBT was hiding. Am now turning off physics simulation locally on all clients on Socketing operations to cover some edge cases / packet miss issues. The attachment grip type now calls attach on all clients to cover some edge cases / packet miss issues. Moved the NavMoveCompleted event into BaseMovementComponent so that SimpleCharacters can trigger it as well. Seated mode now replicates and throws the OnSeatedModeChanged event to ALL players, not just the server and owning client. This allows you to react to it locally on simulated proxies as well. Changed the gesture components material that you can set for spline drawing to be a material interface instead of a UMaterial *. This way you can pass in material instances. Added in a bool to ignore gesture scaling for specific gestures, Also the ability to save gestures without autoscaling them to the database. Merged in a client authed movement mode fix that Epic added. Fixed multiple replication issues with grip scripts and net relevancy, they should be solid now. Removed dropping a grip if killing the motion controller and we are not the grip authority. Added a flag to grip scripts that allows the user to notify the gripping controller that it should drop the object as soon as possible. Added bIsForTeleport to grip scripts GetWorldTransform variables, useful to know on the grip end. Added BlueprintType to the base grip script class so that they can be directly referenced in BP. Fixed multiple bugs in the new Interactible Settings grip script. Added UAISense_Sight_VR, a drop in replacement for UAISense_Sight that offsets to a VR characters HMD location. Simplified and improved the HybridWithSweep grip type. It should now performs less operations while also being of a higher quality. Corrected a bad commit on the dial component that was causing some incorrect rotations. This brings the flow of execution for dropping to parity with how it is done on grip. Many many optimizations and clean ups regarding the gripping and dropping functions, lowering code bloat. empty it will attempt to use the grip ID to drop instead. used as a grip id, this lowers the total number of possible simultanious grips per hand from 127 to 126.
that people can access it and set variables on it (if it is a blueprint base script that is). flag for quantization of the rotation on controllers / cameras. of the engine BYTE rotator quantization. Also dropped a byte out of the CustomVRInputVector and RequestedVelocityVector. 41,943.04 UU's should be MORE than enough leg room for these values. also be restricted like this. This is to remove "climbing mode" hanging in place and seated mode issues. Really only an issue in really high packet loss situations, but wanted to cover it. Set OnClimbingSteppedUp to a BlueprintNativeEvent so that c++ users could use it. Set GetOpenVRModelAndTexture node to not fail out if a texture is missing and to just pass out a nullptr now. to merging into the master branches. if replicate movement was never on the object. state by default so in that case the client also calls it now. default setting is inverse between c++ and BP. original grip constraint can reset the transform out of order prior to destruction. switched sweep detection on grips to component multi instead of sweep single. That function automatically accounts for the pivot offset / collision local pose. Last edited by mordentral; 04-22-2019, 11:48 PM. Thanks for the info. I did find an open source IK solution but have not look at how to use it with VR Expansion. https://github.com/hacoo/rtik. I do have the plugin from Yuri (VR IK Body) but it's been a challenge to get it to work properly with VR Expansion plugin. It's mainly because his documentation is totally lacking and the videos are really hard to understand. But maybe your information about changing those settings in the VR Character might be part of my issue with this. But if someone has a tutorial or example of a plugin and VR Expansion working together I would really appreciate the help. I was wondering what is the best Full Body IK solution to use with VR Expansion. Do you have any examples of how this would work with your solution? I know that multiple people are using Ikinema and the new Full Body IK by AnimIK on the marketplace, I assume that others are using Yurik's as well but I don't know much about it. A lot of users used to use BIK but its pretty much gone now. I am not the best one to ask about this though as I can't package any IK solutions into the template or the plugin and haven't played with the marketplace offerings much. I don't think you will find something on the level of quality as Unity's FinalIK though for less than an exorbitant fee. As for setup, generally you set the parent relative component to "floor mode" and attach the mesh and run the IK logic. Some of the setups have built in rotation detection so you would likely also want to set the ParentRelativeAttachment to IgnoreParentRotation to let the IK handle it itself. I have some backend stuff going with some people about possible IK things, but I wouldn't wait around, its not something I can dedicate myself towards as its pretty much an entire project in itself to maintain a good IK plugin and I am not sure how serious they are about maintaining it if I helped out initially. Last edited by mordentral; 04-26-2019, 09:58 AM. I can't for the life of me figure out how you managed to make the capsule follow the HMD. I researched for ages and they all pointed to this yet I don't see which specific set of functions do that. Its in the VRRootCapsule C++ source, I am overriding the physics thread update and the local rendering to move the capsule. The actual "location" is the same so it took re-writing most of the character class to use the offset location. Its likely not "the" best method, but it was a challenge and I really liked have free reign over where I place the capsule relative to the head without clunky second actors or other methods. It also lets "feet level" be actor zero, which makes a lot of sense when handling things in VR. Back in earlier engine versions there was an AlternateLocation function on scene components thta would have made it simplistic...sad thats gone now. How does the VR Expansion Plugin manage Physics Settings? If I use a CCD with a large weight of Object Collision and a Mesh Component, I get the result I want, but I feel that the frame is delayed when I use the CCD. Do you have something better idea? CCD shouldn't have any effect on "delay", its just running collision in substeps. Its more likely that your "weight" being higher is dragging on the constraint. Also I don't use the physics handle component, I duplicated its setup with several changes and baked it directly into my grip controllers. I don't, that is just hull penetration, you would have to adjust your physics settings or manage the collision body better. It's a little far from the question of VR Expansion Plugin, but would you mind if I ask you a question? Physical handling is performed based on the PhysicshandleComponent, but if you grab and swing a thin collision's Sword quickly, the Hit does not occur and just passes through. VR Expansion Plugin confirmed that this problem does not occur. How did you approach it and solve it? Last edited by WildEric; 04-24-2019, 02:58 AM. I'm trying to play the grab animation even when there is nothing to grab. Sounds pretty straightforward but i'm having a difficult time. Originally I tried to set the hand state in the pawn, when that had no effect i tried to set the animation like this... still no effect, where can I set the grip state? is there an easy way to do this? thanks for the plugin Mordentral! I didn't have any hand animations or copywrite free hands so I just copied Epics setup over for people that were used to it anyway. The CheckAndHandleGripAnimations functions checks for current overlap state and/or gripping state and assigns an enum value in the AnimBP to control the current hand animation. update: I found where you can switch animation modes to from blueprints to anim states so that code works now but it doesn't transition. Last edited by coteking; 04-24-2019, 10:37 AM. I used this plugin on my project but my characters head can still go through objects? How do you properly set up the VR Character so that it collides with all objects? It collides with static objects by default, you need to manage other collision channels yourself as to which ones it should collide with and which ones it shouldn't.